How much is the U.S. debt? The United States debt was at $10 trillion back in 2008. Currently, the national U.S. debt is at $19 trillion and at the end of FY 2016, the total government debt in the United States, including federal, state, and local, is expected to be $22.4 trillion. This means the national debt doubled in the last eight years of the current administration. More government spending will lead to more debt but the debt cannot grow forever. 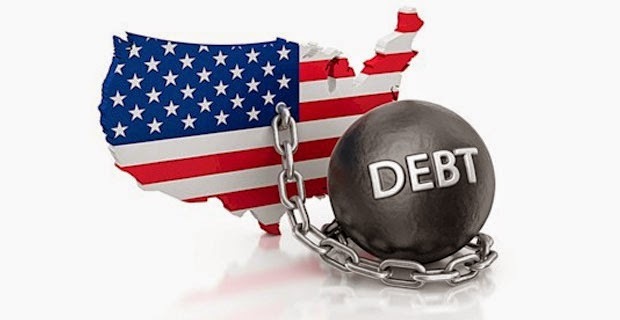 If the government continues its path of continued spending and increasing debt, the U.S. Government will default on its debt and this will cause a depression around the world. We already experienced the negative effects of Greece’s debt crisis, which is a tiny country compared to the U.S. A default by the U.S., the largest economy in the world, would cause the worst financial crisis the world has ever experienced in human history. Due to the high debt, the Federal Reserve has to make sure to keep interest rates low because the U.S. cannot afford paying the debt at higher rates. The government hoped that by lowering interest rates, the economy would experience a boost through increased investments. Then the U.S. would be able to pay off some of its debt. However, the major boost did not happen. Some economists say that savings are necessary as well. However, due to low interest rates, there are no savings. How are interest rates kept low? With the financial crisis reaching a pitch in 2008, the Federal Reserve took to flooding the financial market with dollars by buying up bonds. This is called the Federal Reserve Bank’s “quantitative easing” asset purchasing program (i.e., expansionary monetary policy). Simultaneously, interest rates fell dramatically, as bond yields moved in the opposite direction from bond prices. The Fed poured billions of dollars into the bond market causing the Fed’s balance sheet to go from $2.1 trillion to $4.5 trillion. However, we have not seen the expected growth in GDP we hoped for from these low interest rates. The stock market benefited from the low rates as the banks barely pay any interest on savings. The S&P 500 doubled in value from November 2008 to October 2014, coinciding with the Federal Reserve Bank’s “quantitative easing” asset purchasing program. But the significant growth in the stock market, stimulated by artificially low interest rates, is vulnerable to bursting as stocks get overpriced. Since the Fed stopped buying bonds in late 2014, the S&P 500 has been very volatile, fluctuating in the sixteen percent range, and as of the day I am writing this article (March 2016), it is more or less where it was when the QE came to a close. Interest rates cannot stay low forever. Eventually, they need to be raised to normal levels. If not, we will face other problems. Due to the Fed’s expansionary monetary policy, there is a lot more money in circulation. While in the short term, an expansionary monetary policy leads to lower interest rates, in the long term, it leads to inflation. With inflation, the interest rates will go up. Otherwise, the banks will stop lending money. In an inflation environment, the lender loses and the borrower wins. Thus, the lenders will demand a higher rate to account for inflation. But with higher interest rates, the U.S. cannot make payments on its debt. With higher interest rates, the Government will face a dilemma. The Government needs to increase the taxes or go further into debt; neither of which are a solution. The Government will not be able to raise taxes, as the taxes are already too high. The U.S. has the third highest general top marginal corporate income tax rate in the world at thirty-nine percent, which is the same as Puerto Rico and is exceeded only by Chad and the United Arab Emirates. Further increases in taxes will destroy businesses. Higher investing taxes will hurt economic growth by disincentivizing investment. The big corporations and the rich will leave the country. Tax evasion is another problem because rich people have the resources as well as the incentives to avoid paying taxes. More people will work in the black market. That is a loss to the economy and raises the federal deficit. The capital that is bitterly needed to be invested here in the U.S. to create jobs would instead flow abroad. All this would result in more unemployment, less growth, and less tax revenues. Thus, raising taxes is counterproductive. We have an exorbitant high national debt. Our politicians are not able to balance the budget. The interest rates are still at a historically low level. There are no savings. The expected increase in investments did not happen. The stock market is volatile and we could face another recession. While the federal debt per taxpayer from 2004 to 2015 increased an average of 7.2% per year, wages continually remain stagnant. The real (inflation-adjusted) median household income has not gone up in the last sixteen years. In fact, it is below the peak set in 1999. The nation’s poverty rate remains high. Forty-six million Americans are receiving food stamps. The five percent official unemployment rate, as released by the Government, is misleading as it excludes those that gave up looking for jobs. The economy is not growing enough and the nation’s debt increases each year. And politically, we are facing major dangers in the world. In other words, we are living in difficult and challenging times. What is the solution to the economic problems? In my opinion, the U.S. must reduce its public debt (preferably before interest rates rise). Otherwise, the U.S. might default on its debt in the future. The problem, however, is that our politicians have a spending issue that causes them to constantly raise the debt ceiling. This issue is not addressed competently by the government. The only way to steer our country correctly is by dramatically changing the course of this government by reducing government spending and rules and regulations that negate business growth, and reforming the tax code. We will need good leaders who understand this and follow through. The public will need to understand that freebies and big government giveaways are not the solution to our problems. They will only make things worse. Milton Friedman used to say “’There is no such thing as a free lunch,’ with the exception of free markets”. Limiting the power of government and reducing government spending will achieve two goals: 1) it will help lower the national debt; and 2) in combination with tax reform and lower taxes, it will boost the private sector. We will see growth again. And eventually, the Federal Reserve can again raise the interest rates to normal levels, which will allow savings. To fix the problem, we need to understand the root of the problem. We cannot solve the problem by treating the symptoms. Our economy is weak due to big government, excessive government spending, high taxes, and costly rules and job-killing regulations. Socialism is not the solution; it only aggravates the problem. We need a strong private market, one which creates goods and services. Currently, our free market and competitive position are compromised due to interference from the government, special interests, and political favoritism. The solution is a free market economy with efficient markets and competition; which we achieve through reduction in government spending, limiting the power of government and trade unions, deregulation, tax reform, lower taxes, and creating more incentives for growth, self-development, and reigniting the spirit of entrepreneurship. This in turn will revive small businesses, create new jobs, and make the nation more productive. The growth will result in higher income and wages across all classes, and a better standard of life. Economic growth generates new government revenues, through which we are able to reduce the national debt and become politically stronger in the world. Finally, less government is more freedom. Daniel Jordan, CPA, ASA, CBA, MBA, is the managing principal of U.S. Valuations, a division of New York Business Valuation Group, Inc. He is an expert in valuing closely held businesses, intangible assets, valuation discounts, ESOPs, hedge funds and private equity fair value, stock options, and life insurance policies. He provides business valuation services full time since 2000. Mr. Jordan can be reached at (212) 203-5186 or by e-mail to djordan@usvaluations.net.